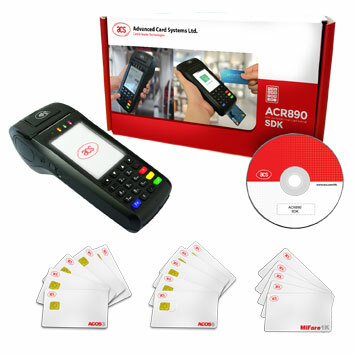 The ACR890 mobile smartcard terminal from ACS is an all-in-one PIN-pad terminal that incorporates contact (ISO 7816), contactless (ISO 14443, Mifare, FeliCa) as well as magnetic card reader technologies. The ACR890 is further enhanced with the addition of 2 SAM slots and a SIM card slot. Designed for mobile environments, this terminal enables wireless connectivity through popular communication protocols including WI-FI, GPRS and 3G. The ACR890 features a built-in thermal printer, a large colour touchscreen LCD display and an integrated speaker for additional audio experience. The terminal's large memory can be further expanded through the additional built-in microSD slot.